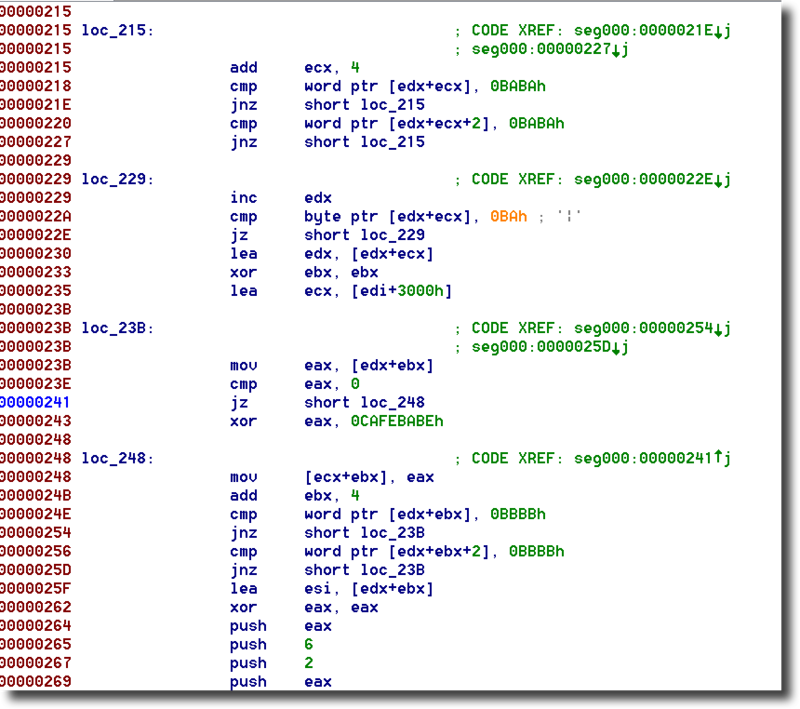 Fileless malware has been gaining increased attention in the malware forensics community as of late. Accordingly, I have been paying particular attention to indicators and forensic analysis of threats such as Poweliks. These malware variants typically leverage the Windows registry to maintain persistence, and they avoid leaving executable files on disk. I recently had an encounter with one such malware family - Kovter. Kovter was originally discovered as a particularly nasty type of ransomware, but has recently been adapted to instead cash in via ad/click fraud. In the sections below I will walk through some basic static analysis of one such sample. Additional analysis of later stages of this malware will follow in another writeup. In case you want to follow along, the sample being analysed in this discussion is: 6ca41538ae9c25b259e6fcfce565b89b (many thanks to Kafeine for the sample). After initial infection, the run key shown below in Figure 1 will be present. *Note that this particular malware will write to both HKLM and HKCU if it is able. The content written is identical in either case. Again I have truncated some content to ease reading. In this case there is a large base64 block which is being converted and then executed via powershell.exe. Naturally this base64 decoded text is just a powershell script. Figure 6 below depicts the version I cleaned up to a readable state. Variable $sc32 in the powershell script contains (unsurprisingly) shellcode to be executed from memory. 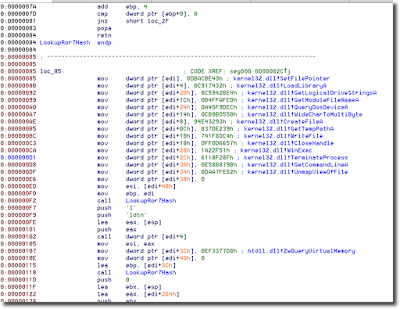 The method of invocation follows a pretty standard execution flow including calls to VirtualAlloc using PAGE_READWRITE_EXECUTE permission and then CreateThread invoking the shellcode as a function from a (now) executable memory page. Note also that it passes the memory address of the shellcode to itself as a parameter. 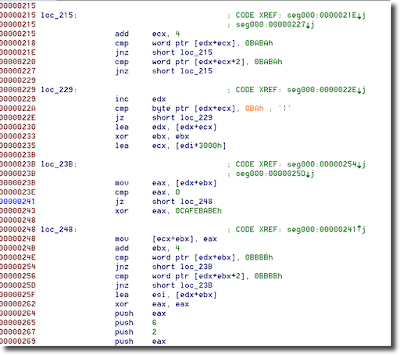 Once the shellcode is loaded, the overall actions are pretty standard, with a couple of interesting exceptions. 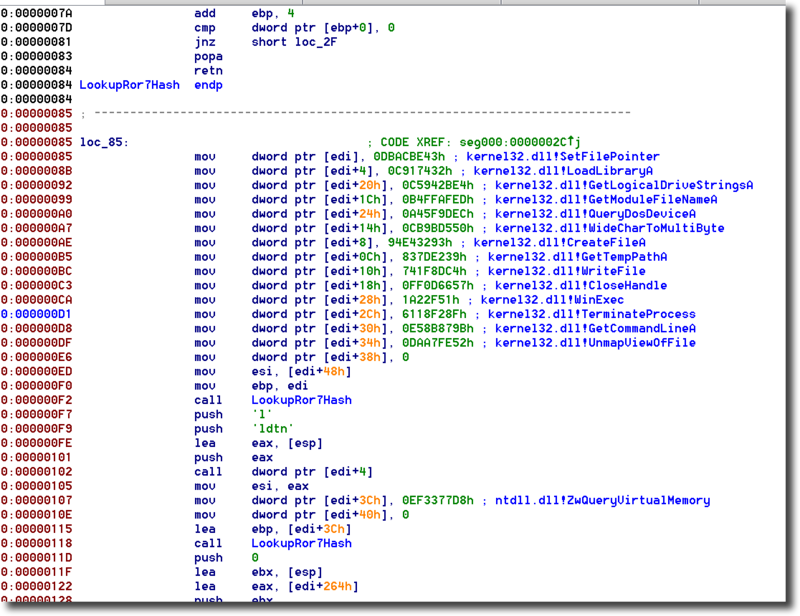 Locate Kernel32.dll using hashing on the BaseDLLName member of the InMemoryOrderModuleList for the current process thread. 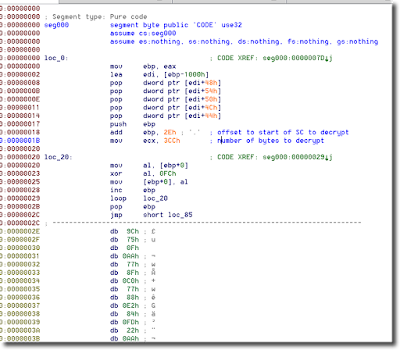 This suggests that the shellcode is modified during initial infection to correctly reference the registry values it will eventually be stored in. Load the content of this registry key (HKCU\Software\2efd7e07\fecae03a in our example) into memory. Call the newly mapped file. In a follow-up post I will walk through analysis of the running payload. Until then, feel free to contact me with any questions or comments. * Note: not only do the encryption key and length change each time the initial infector is run, but if the registry key is deleted, a watchdog process reinserts the values immediately - and each time the data is reinserted, the encryption key is modified.